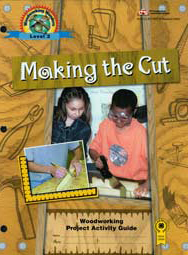 This level is designed for youth who have had experience using basic hand tools, such as a hammer, hand saw, or drill. Youth will measure, cut, sand, drill, use advanced hand and power tools, apply paint, and use bolts and staples. Woodworking project choices include building a sawhorse, birdhouse, tool box, or stool. Life skills emphasized in this curriculum are communication, decision making, planning and organizing, and learning to learn. Grades 4-6.